23-Feb-2014 -- This is the second out of 3 reports reaching or attempting confluence points around Valencia. After a literally pointless hunt of 39°N 1°W, David and I drove to Sot de Chera, where we spent the night under the stars at the Hermitage Ermita de San Roque. The next morning we had a giant breakfast in order to ride all the way up to the confluence with our bicycles. However, it turned out that the road was not strictly monotonically increasing in height. The road went up and down several times. Therefore the effort needed was greater than expected. Shortly after noon time, David had to return to his car, while I continued riding towards the confluence point. After passing through the old village Arcos de las Salinas (3.5 km from the CP) I continued the road towards Torrijas until I had reached the minimal distance of 770 m. I parked my bicycle down at the river at an altitude of 1040 m and climbed a steep mountain flank, gaining 300 m in height. Some parts of my route were over loose rocks that began to move downwards when I climbed over them. But I crossed some tracks that can be followed to avoid any risks. 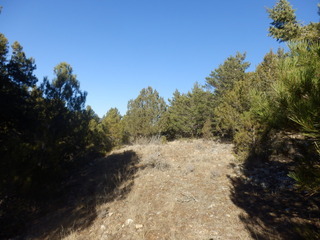 Half an hour later, I stood at the confluence point that is located in a pine forest with some clearings. From the confluence, there is a direct view to the Javalambre Mountain (2020 m) with some snow cover and the Observatorio Astrofísico on top of it. I went cautiously down the same route that I had come and continued cycling westwards to Torrijias. The story continues at 40°N 0°W.